At first Attractio looks as though it might have something interesting to say about reality television and our need for entertainment, wrapped up in a game with some solid puzzle-solving. Unfortunately that goodwill is quickly squandered by a poor presentation and a complete failure opportunity to make the most of its theme. Related reading: The Witness is going to be the 1000-pound gorilla in the puzzle world for many years to come. Mikhail's fill review. You alternate between three protagonists, each with their own motivation for participating in a world that recalls the old Arnold Schwarzenegger movie The Running Man. Here each contestant is taking part in a life or death game that only offers one way out - win the game, or else you die. Different prizes are dangled on top of survival, enticing each contestant to participate in these brutal games. Mia is a law enforcement agent from Mars who is interested in a technological reward. Keir is simply in it for the life-changing amount of money he would win. Dalek is a criminal who has been offered a chance at freedom if he wins. The events of the game take place on the Entertainment Space Station, an orbiting satellite around Mars. To add further distinction to the characters, each one tackles puzzles in a different fashion. My favourite is Mia with her boots that allow her to flip gravity. Some of the rooms she'll have to navigate through have a low ceiling and it is just a matter of avoiding the pit in front of her by springing up to the ceiling. However her puzzles eventually become far more interesting as she has to navigate high ceilings where flipping gravity would cause instant death. 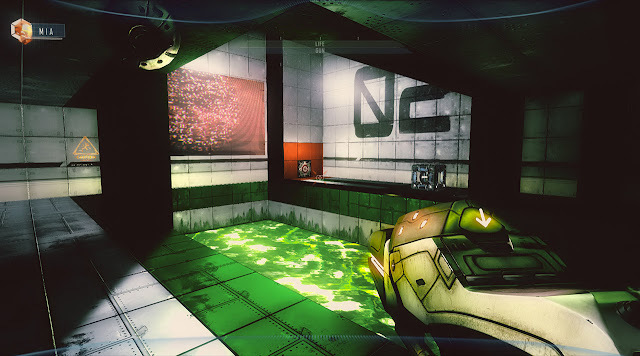 Keir uses a gun (this is presented as a first-person shooter similar to Portal, Magrunner or any number of similar games) that can change the gravity of specific blocks. Sometimes these blocks are used to strike switches, while at other times you ride them to safety and more. Dalek has the toughest go of it as he has to use both (it's almost like the in-story game makers realise that releasing a convicted criminal on society could be a bad thing by stacking the odds against him). 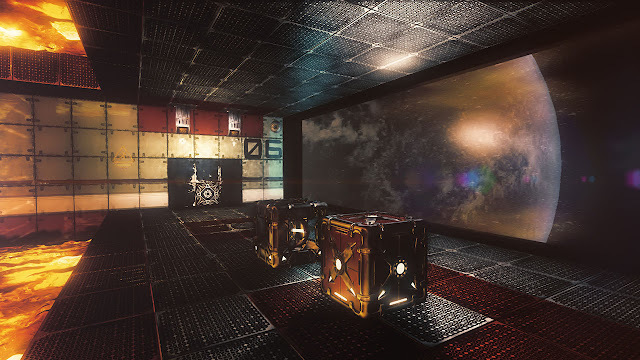 The puzzle premise works, and quite often they are appropriately challenging. To that end, Attracio actually does a really good job of creating an environment where the puzzles fit in and while they start off simple enough, some of the later ones are absolutely head-scratching (or hair-pulling if you prefer) at times. Not because they are unfair or poorly explained, but because there are so many different things to account for. A generous checkpoint system certainly helps to ease the potential frustration. It does not help that the actual controls themselves often feel imprecise and stiff. It is quite frustrating to work through a lengthy puzzle only to be undone by a janky animation or something triggering in a way you would not expect. The way the puzzles progress and layer upon themselves over time is impressive, and I seldom felt like I was being shoehorned down a very specific pass when solving a stage, but there are still some rough edges in the gameplay itself. So from the mechanical side of things, Attractio actually delivers. Where it comes up short is in the narrative. 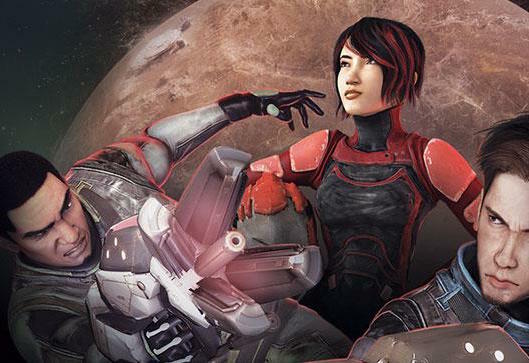 The character stories show very little progression, and the opportunity to poke some fun at the rise of reality television as a viable form of entertainment is more or less glossed over after the early stages of the game. I am alright with the incredibly basic visuals, which look dated but at least provide a clean, easily distinguishable playing field for the myriad puzzles you will face off with. This does unfortunately feel like a missed opportunity in and of itself. The windows looking out at space, some of the light reflections - they have a glimmer of that visual appeal that I enjoyed so much in other games with a science fiction setting, but the end result is flat more often than not. The audio however, does not hold up even that well with some of the most boring voice acting I have heard in a long time. The dialogue is delivered so stiffly that it actually took me out of the narrative that continued to lose steam even as I dove further into the game. It's not like this theme can't be run with, either. Manhunt, for example, way back on the PlayStation 2 was an enormously effective commentary on the fetishistic voyeurism that we often engage with in our modern society. The idea of whether violent, or even death sports constitute a kind of entertainment that tells us something about our nature as humans is another worthy theme to explore. Attractio does the right thing in setting these elements all up, but then really struggles to execute on them in any meaningful way. In a world that has just been gifted something of the complexity of The Witness, it's now that much more difficult to forgive unexplored depth in otherwise shallow puzzlers. Attractio is one of those games where actually getting through the storyline would only take a few hours, but there is so much trial and error that the game almost feels padded as it weighs in closer to ten or eleven hours. By the time I was done, I reflected on how much new territory I had actually traversed and come to the realisation that it was not a lot. If you get easily frustrated by difficult puzzle games of this nature, Attractio will likely punish your patience. If you have the fortitude to stick with it, the puzzles are incredibly rewarding upon completion. It is amazing how this game can go from making me feel like a moron to a genius in a matter of minutes, but there it is. Related reading: Another first person puzzler you could consider is Q.U.B.E. Sam's full review.